In the 6th century, in the Visigothic Kingdom of Spain, there was a formula for worship known as the Mozarabic Rite. This rite is sometimes called the Toledan Rite for the city, Toledo, where it is still used in a modified form. It is also sometimes called the Isidorian Rite because some scholars think it was influenced by St. Isidore of Seville. In form and content it is very close to ancient Celtic and Gallican rites and a 4th century rite used in Milan. Peter ran with John to the tomb and saw the recent imprints of the dead and risen man on the linens. The word imprint is a translation of vestigia which can also mean trace or marks. It can also mean footstep or footprint, but that does not make contextual sense. Is this startling? How did such an idea come about? Was there an early traditional understanding that Jesus’ image was left on his burial shroud? Or was this just an invented idea? It is so completely without biblical foundation, including extant non-canonical gospels, that is seems strange. We must look to the historical evidence. Historian Ian Wilson has found that Pope Stephen III (reigned 752 to 757 CE) stated that Christ had . . .
spread out his entire body on a linen cloth that was white as snow. On this cloth, marvelous as it is to see . . . the glorious image of the Lord’s face, and the length of his entire and most noble body, has been divinely transferred. On August 15, 944 CE, a cloth known to us as the Cloth of Edessa, was forcibly transferred from Edessa to Constantinople. It had been in Edessa since at least the middle of the 6th century when it was found concealed behind some stones above one of the city gates. It was, to the people of Edessa, the lost cloth of a great legend, the cloth brought to Abgar V Ouchama, the King of Edessa (13 –50 CE) by a disciples known to us as Thaddeus Jude (Addai) who was dispatched to do so by the apostle Thomas. According to the legend, the infirm king was miraculously healed when he beheld the image of Jesus’ face. Problematically, written accounts of the legend refer only to a facial image, one that had been miraculously produced by Jesus. In the late 6th century, Evagrius Scholasticus’ Ecclesiastical History mentions that Edessa was protected by a “divinely wrought portrait,” an acheiropoietos sent by Jesus to Abgar. In 730 CE, St. John Damascene. in his anti iconoclastic movement thesis, On Holy Images, describes the cloth as an himation, which is translated as an oblong cloth or grave cloth. This may be the first mention, among extant manuscripts, of it being a grave cloth. Extant manuscripts don’t suggest why the cloth was hidden away above a gate in the city’s wall. Perhaps it was hidden to protect it from Persian invaders. If it was in Edessa very early then perhaps it was hidden to protect it during times of Christian persecutions. There is evidence of local persecutions in this early Christian community in the latter part of the 1st century and of Roman persecutions that persisted until the time of Emperor Constantine. If, in fact, the cloth was taken to Edessa in the 1st century, it might have been hidden for protection as early as the reign of Ma’nu VI, Abgar’s son, who is thought to have reverted to paganism. On the occasion of the transfer of the cloth, on the very day after the arrival of the cloth in the Byzantine capital, Gregory Referendarius, the archdeacon of Hagia Sophia in Constantinople, preached a sermon that provides a vital clue. The sermon, which was recently rediscovered in the Vatican Archives and translated from the ancient Greek by Mark Guscin, reveals, explicitly, that the Edessa Cloth contained a full length image, one that was believed to be of Jesus. It had obvious bloodstains from a side wound. So how did a traditional understanding come to Spain? St. Leander, a Benedictine monk and a bishop of Seville visited Constantinople roughly between 579 and 582 CE, only shortly after the image bearing cloth had been rediscovered in Edessa. Perhaps, on his return to the Iberian Peninsula, he influenced the composition of this one illation in the Mozarabic Rite. That is, of course, only speculation. But that there was communications between the East and the West is certain. What evidence is there that the Edessa Cloth is the Shroud of Turin? We know that the sacred objects are preserved by their predators in Venice and France and in other places. In 1207, Nicholas d?Orrante, Abbott of Casole and the Papal Legate in Athens, wrote about relics taken from Constantinople by French knights. Referring specifically to burial cloths, he mentions seeing them ?with our own eyes? in Athens. There is significant evidence that in Edessa as well as in Constantinople, the cloth was kept folded in such a way that only the face was visible. 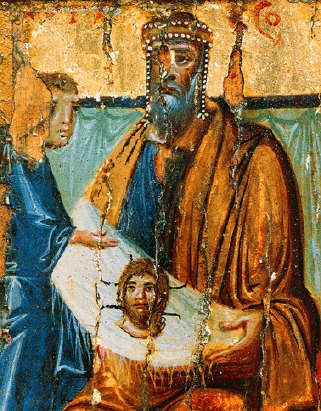 By folding the cloth, doubled in fours (tetradiplon) that is exactly what results?a centered face of Jesus on a horizontal folded cloth?as seen in a 10th century painting of Abgar V holding a picture that is odd for its horizontal shape as a portrait. Here He rises again and the sindon [Shroud] ? is the clear proof ? still smelling fragrant of perfumes, defying corruption because they wrapped the mysterious naked dead body from head to feet. John Jackson, who was one of several physicists who physically examined the Shroud in 1978, used special raking light photography to reveal ancient fold marks on the Shroud. He found persistent creases exactly where expected and in the correct folding direction for just such a tetradiplon folding. Methchild Flury-Lemberg, a leading authority on historic textiles and the former curator of Switzerland’s Abegg Foundation Textile Museum, points out that the Shroud is similar to linen woven on Egyptian or Syrian tombs and used in Roman occupied Palestine. She also reports that the Shroud resembles unique ancient textiles found in tombs of the Jewish palace-fortress Masada, reliably dated to between 40 BCE and 73 CE. Pollen evidence tied to possible floral images, traces of travertine aragonite that is unique to the Jerusalem environs, and the forensic matching of the bloodstains on the Sudarium of Oviedo all suggest the Shroud?s historical journey originated in Jerusalem and was later taken to Western Europe, where it has been since the mid-fourteenth century.